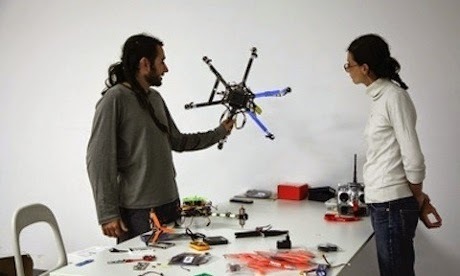 Lot Amorós, an artist along with two engineers, namely Cristina Navarro and Alexandre Oliver were winning the Next Things Award 2013 for having created a flying (drone) phone. Dubbed Flone, this device has `H` shaped and act as fuselage that allows smaprtphone can fly like a flight instrument. Flone claimed to be able to fly up to 20 meters, and has the ability remotely to take photos and record video from the top. As reported by the Guardian on Monday, August 4, 2014, Flone designed to be a simple and inexpensive device, with a fuselage made ​​of wood as well as battery powered and four propellers. "We are trying to simplify all the drone technology and we tried a new way to control it," Amorós told BBC. Interesting Flone features while on the flight is the smartphone can be controlled remotely by other smartphones using the Android application via a Bluetooth wireless connection. "What we have done is to change the concept that little drone is not something that can only be owned by people who have a lot of money," said Oliver.